These palms are growing beside Reedy Branch on the Craven and Jones County line near New Bern, NC. 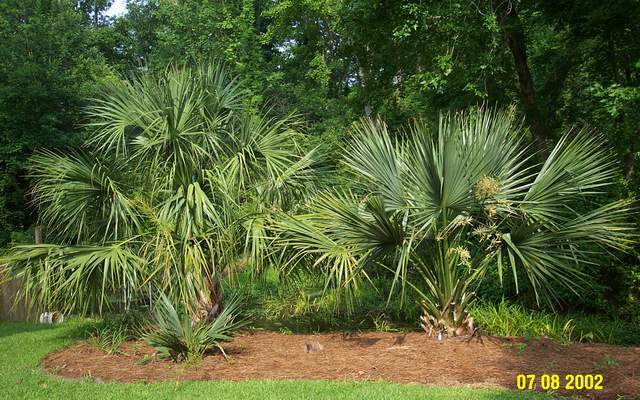 The seed that produced the palmetto was planted in the Fall of 1986. The "Birmingham" was purchased as a 2 or 3 year old seedling in November, 1986 from Woodlanders, Aiken, SC. Both were grown on in 5 gallon pots until planted here in the early 90's. The Sabal "Birmingham" is extremely cold hardy, having endured below zero in Raleigh, NC and 11 below zero in Tulsa, OK. This may prove to be a zone 7 hardy Sabal. Much slower growing than palmetto. 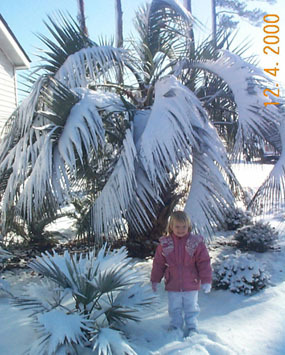 After established palm has never shown any cold damage with temperatures as low as 6 degrees here near New Bern, NC. No one knows for sure what this palm is, but could possibly be a hybrid. 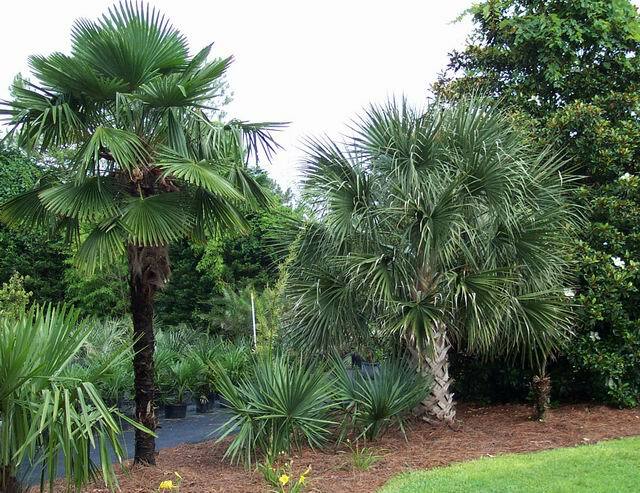 According to Birmingham, Alabama newspaper accounts, the original 'Birmingham' palm was thought to have been brought from California in 1910 by Miss Alexander and planted at her home in Birmingham, Alabama. 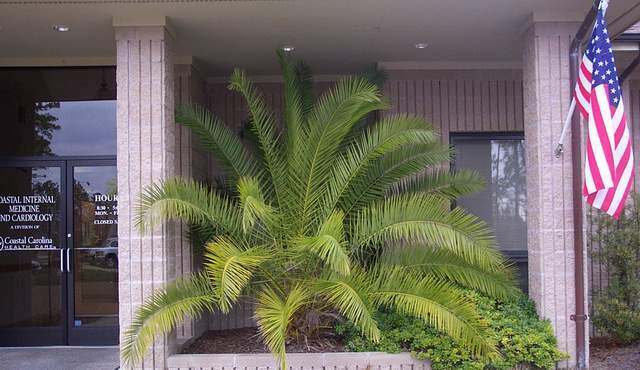 In all the years it lived there, the palm endured many severe winters, including the very severe winter of 1962. After her death, the palm was moved to the Birmingham Botanical Gardens in 1976. The Sabal 'Birmingham' seedling, on the right above, started producing seed in 1997. I have been growing seedlings of this tree and three others here since that time and now have 15 gallon plants about 3 feet tall. In the Spring of 2003, the Birmingham Botanical Gardens allowed me to donate a 10 gallon seedling to the Gardens, so there would be one at the location of the original. From left to right: Needle palm, Windmill Palm, Sabal minor and Sabal palmetto.